Y'all should know by now that I love my stoner rock, doom, sludge etc with a dash of funk. Not to be confused with THE funk. I'm not talking Bootsy Collins, stacked heels and big afros. No, I mean just a touch of groove, faintly upbeat riffs and a tempo thats not afraid to step it up a gear every now and then. The sort of thing Iron Monkey did with sludge or Mountain Witch did with doom. Dare to toy with another genre outside of you're typical boundaries every so often and it can pay off. 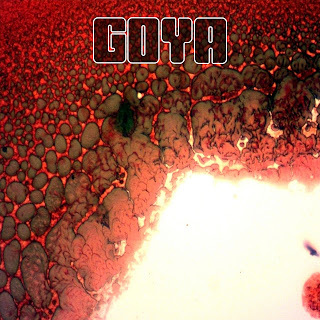 On which note it would be a perfect time to introduce you to Arizona's one and only Goya - masters of the fuzzy riff, dealers of doom and off the back of this demo alone, giant slayers. Yup, this Phoenix three piece may have only been belting out tunes since April this year, but they've more than proved that they can stand toe to toe with daddies when it comes to producing world class stoner doom metal. In fact I would probably go as far as to say that when it's come to demos we've received over the last couple of years, this little corker certainly ranks in the top three. Fusing the age old elements of weed and crushing overdrive the chaps have managed to circumnavigate the pitfall of being lumped straight into the stoner doom stereotype by incorporating a few certain subtle nuances. Sure, the key details are all there; the fuzz, the distant vocals, the six minute long tracks, but theres so much more. Namely bouts of sporadic psych, bursts of southern rock furiousness and even the odd touch of post metal ambience creeps in from time to time. Unorthodox? Sure, but if it works it works, don't knock it! I would even go as far as to say that this will even sway over many of the die hard purists of the genre that so often turn their nose up at bands that try and throw in a little something different. It's fresh, its dark, its fuzzy but the real fact of the matter is; if this is the just the demo, what the hell do these guys have in store for the full length album? I'm looking forward to it and I can pretty much guarantee that following the final closing bars of Night Creeps you will be too!... and who said no good ever came from drugs?